Let's continue with EAP Utilization Hack #17 (I accidentally skipped a number.) We are counting down ot #1. We're talking EAP refresher training. This is critical for EAPs, but few formally do it. 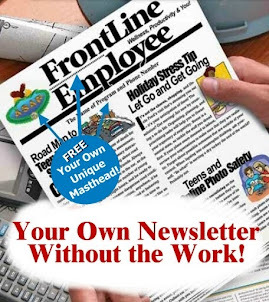 It's guaranteed to boost utilization, both of self-referred employees and supervisor-referred employees. Refresher training is follow-up training that allows supervisors to examine their experiences in using the EAP over a defined period of time. The goal of refresher training is to learn how to use the EAP effectively, manage difficult employees with greater ease, and clear up questions, misconceptions, or roadblocks common among supervisors that typically interfere with, or inhibit use of the program. Refresher training reduces risk to the organization because it increases the likelihood of employees with serious troubles getting referred. 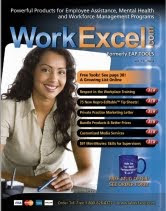 Print brochure for WorkExcel.com "EAP Refresher Training" product. For example, a supervisor meets with an employee and formally refers him or her to the EAP, but fails to phone the EAP first, send documentation, or request that a release be signed. 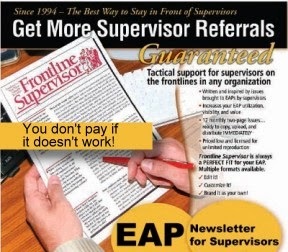 The supervisor than hears nothing back, phones the EAP, can't get information because no release exists, experiences frustration concluding that the program is not very helpful. Ideas for EAP Refresher Training! Put together your own program using these concepts below or consider use of WorkExcel.com materials. 2) Discuss importance of communicating with the EAP before, during, and after the referral--not about the nature of the employees programs, but the the mechanics of communication, both when, why, and how all with the goal of helping the employee and salvaging valuable workers. 4) Clarify what is meant by mandatory referral, formal referral, informal referrals, last chance agreements, and firm choice agreements. Many supervisors confuse these terms and they all have different meanings and implications in the management of troubled employees. 5) Talk about reducing emotional involvement, unbridled anger, and power struggles with employees. 6) Talk about how to maintain control of the communication and verification process with the EAP. 8) See the products associated with refresher training at this link.